Dub edits: Where Are the Vikings Anyway? 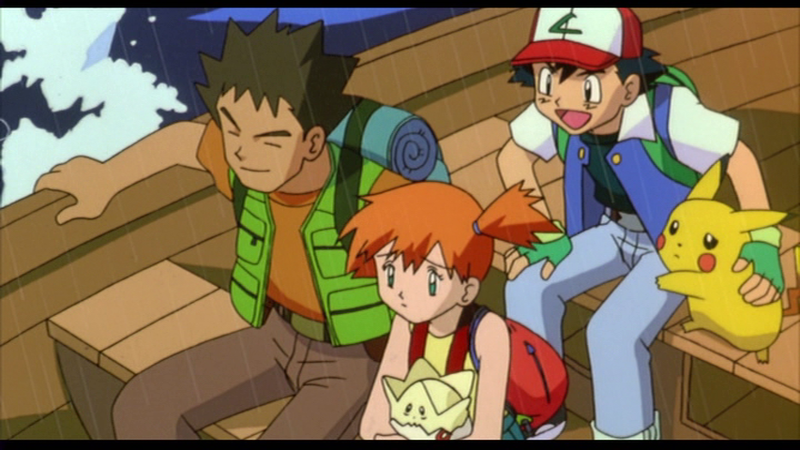 Ash and friends are desperately trying to reach New Island in the storm, but come to the conclusion that using their Pokémon is out of the question. 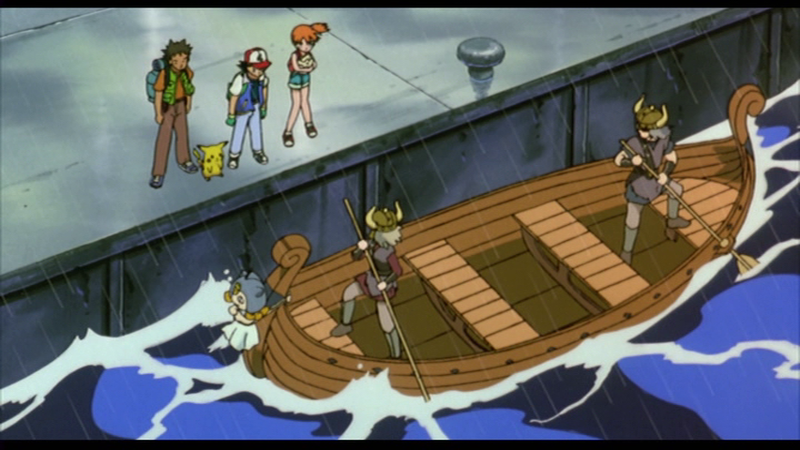 Just then, Jessie and James disguised as vikings row up in a boat (with Meowth disguised as the figurehead), and offer them a lift. In Japanese, Jessie offers the twerps a ride, though it might not be free. You vant to cross, maybe? Ve take you, ya? Ve Vikings are used to big vaves. Ve get you to New Island faster than you can say Fahrvergnügen. The word Fahrvergnügen is a German neologism meaning "driving enjoyment" created as part of a Volkswagen ad campaign in the United States from 1990. It has nothing to do with vikings. 4Kids inserted it because... it's not English? Do they not understand that Germany is not part of Scandinavia? Or were they just being racist? Why did they feel the need to reference a car commercial that was already dated, and would become completely forgotten in about five minutes? Did they get paid by Volkswagen? Or rather, did they get sued by Volkswagen for this? It's also not funny. I didn't know vikings still existed. They mostly live in Minnesota! What the heck was 4Kids thinking here? To understand this joke, you need to be familiar with American football, and know that the NFL team for Minnesota is called the Vikings. How many ten-year-olds in the audience are going to get this joke? I know that I at the time didn't get it, even being in the United States and knowing some things about football through osmosis. I originally assumed that the descendants of the vikings must live in Minnesota (actually, that's not even wrong. 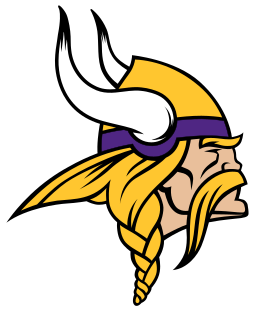 The team is named the Minnesota Vikings in honor of the Scandinavian heritage of Minnesota's population). It wasn't until later that I realized the football connection. If 4Kids put this joke in for the parents, how many of them are going to get it? It's not like every parent in the United States is that familiar with football. And even if someone gets this joke, is it even funny? Was it worth breaking the fourth wall for this? And did 4Kids consider what happens when this movie is brought outside of the United States, where there's even less hope of someone knowing about American football? Ali Rıza tells me that the Turkish dub translated this so that Brock says, "I didn't know Vikings still existed!" and Ash answers "They probably live in America." Which I guess is just the localizers directly translating the line and maybe letting a bit of their own incredulity shine through. The Italian localizers apparently couldn't leave something so absurd in the script. Rosy tells me they changed Ash's line so that he answers "Maybe these are the last ones". Which is not a joke, and not particularly interesting, but at least it's not untrue. The real hilarious thing about this part is what happened in the dubs of places where Vikings actually once existed. The Danish dub has Ash answer, "They are mostly touring in Sweden." The Swedish dub has Ash answer, "They mostly hang out in Norway." I don't have information about the Norwegian dub, but I hope it says, "They are mostly over in Denmark". Meanwhile, the Polish dub has Ash answer, "They mostly live in Scandinavia". Thanks, Poland. I love your deadpan humor.